Good views from all bedrooms. With its scenic location on the Rob Roy Way, Strathyre is particularly well located for walkers and bird watchers and there are many places of interest in the area. Eight miles north of Callander and a little over an hour's drive from both Edinburgh and Glasgow, Strathyre is well placed for exploring much of Scotland. Loch Lomond, Perth, Fort William, The Loch Lomond and Trossachs National Park, Glencoe, the Arrochar Alps and Stirling are all within easy reach by car. The more adventurous may choose to drive to Oban and catch a ferry to one of the islands. Strathyre is located 19 miles from Stirling and 31 miles from Perth. Strathyre is in the heart of attractive countryside and is also a convenient base from which you can explore the Trossachs, often known as 'The Highlands in Miniature' and which has long been regarded as one of the most scenic areas in Scotland. The Strathyre valley straddles the river Balvaig which flows between Loch Voil in Balquhidder and Loch Lubnaig. The hills on each side of the valley are covered by the Strathyre forest. Spring and autumn are particularly colourful seasons. 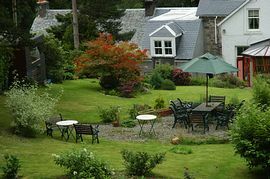 Strathyre and the surrounding areas are rich in birds, wildlife, woodlands and flora. Accommodation at Rosebank comprises five bedrooms which are fully equipped with television, coffee and tea-making facilities and from which you can enjoy excellent views of the garden and surrounding countryside. Rosebank House has a comfortable lounge equipped with coffee and tea-making facilities, satellite TV, a DVD player, an XBOX and a variety of board games. 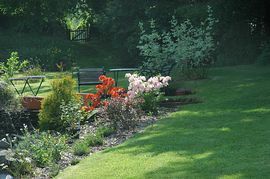 You can also enjoy the superb view from the large attractive garden or relax in the conservatory. 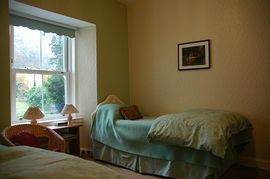 £28.00 per person sharing a double room. 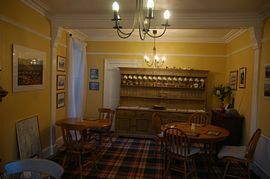 £32.00 (£56.00 in July and August) for single occupancy of a double room. Pet Facilities: Pets are allowed. Well-behaved dogs. Lovely place. Fantastic bed. Excellent breakfast, very friendly. Very thoughtful finishing touches. Will definitely recommend it. - Jill Stevens, Gateshead, Tyne & Wear, Jane Collinson, Newcastle Upon Tyne. Lovely accommodation & hospitality. Thank you. Superb rooms & views - A&T Lyons. Corby. Northants. Lovely B&B Thank you. - Bea & Marina Di Konnning, Netherlands. Thank you for your warm hospitality - Sally Simand, Saltspring, B.C. Canada. We enjoyed every minute in your beautiful house. May you have many precious years in this piece of heaven. - Dennis & Anita Oliphant, South Africa. Really a loveable place. We enjoyed every instant of this part of heaven. - Stefano and Ssabrina, Italy. 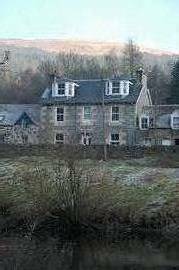 Strathyre is located 8 miles north of Callander on the A84. It is on the right (when driving north)towards the northern edge of the village.